Buying a house w unpermitted renovations can cost big $! Buying a house renovated without permits can have unforeseen costs. Picture this: you’ve been engaged in serious house hunting for the last 9 months with no success. You’ve come across several houses that you’ve put offers on, but you’ve always been outbid. You’re on the verge of throwing in the towel… when you see it… a beautiful newly renovated 3/2 house with 2,000 sqft, a pool, new shiny porcelain floors, new granite countertops, stainless steel appliances, new baths, new A/C, new almost everything. Even though it was built in 1975, it looks and smells like new construction. Not only that, it’s in the area you like AND (somebody pinch you…) they are asking a price you can afford! You tell your Realtor to put an offer in right away. Luckily, you’re working with a seasoned professional who immediately performs a public records search. They discover the seller bought the property 6 months ago as a foreclosure at a very discounted price as it was in need of major renovation. However there is no record any permits were pulled for this work. Your Realtor calls you back and informs you of this, but you recall the listing agent had mentioned the seller is a building contractor. In fact, she reassured you all work was quality construction. What are the risks of buying a house renovated without Building Permits? 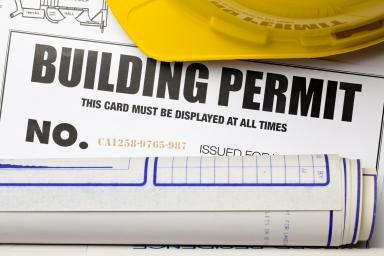 Building permits are required for any work that could affect the public’s health/safety if improperly performed. The owner or a licensed contractor can obtain a permit by filling out a few forms and paying a small fee. Plans and specs prepared by an Architect/Engineer describing the alterations are required for projects where structural elements or major electrical, air conditioning or plumbing systems are altered. Minor alterations may require a permit but usually do not require plans and specs. Local Building Officials will review and either approve or reject the work. The contractor must schedule inspections both during and at the completion of the project to verify the work is performed in accordance with current building and safety codes. Many property owners/contractors feel they can make these changes without a permit, however, local Building Officials have the legal authority to impose penalties for non-compliance. It’s essential to understand this problem doesn’t go away when the property is sold, it just passes to the new owner. The requirement for the permit is passed on to each subsequent owner of the property. If renovations requiring a permit were made to a property in 1985… and the property was later bought/sold several times… the Building Official has the authority to force the current owner to apply for a permit and have the old work inspected. If the old work is not up to today’s codes and specs, the current owner must apply for a permit and have the work corrected and re-inspected in order to have the permit closed. All previous owners (including the owner that performed the unpermitted renovation) are off the hook. Many construction projects involving structural alterations require both intermediate and final inspections. After an un-permitted project is completed there may be items hidden behind walls, floors and ceilings. The inspectors will not assume that everything was performed correctly, they will want to see the hidden items. The current property owner is required to submit Architectural plans/drawings for the previous work. However, the original plans (if they existed at all) may have long since disappeared. New drawings of the previous work will need to be made, and most Architects/Engineers do not like to document another’s design. A General Contractor may need to get involved to disassemble, dig up or expose all elements that need to be inspected and verified. This process can cost three times what it would have cost to obtain a permit and get it passed by the building department. Most small violations will likely go undetected by the building department. They are quite busy and don’t actively look into people’s homes or buildings. Lots of people add an electrical outlet or light fixture without a permit. Converting a garage to an extra bedroom is another common alteration quietly performed by homeowners without a permit. Even if the building department discovered that minor alterations were performed without a permit, an owner can easily remove or change them back to the original condition with only a small fine or reprimand. The current owner can be faced with additional fines and liens on their property if they do not resolve all issues and satisfy the permit requirements. Some property owners find it cheaper and easier to remove the addition or renovation and start from scratch with an Architect or General Contractor. I know of one poor buyer in Fort Lauderdale, FL who recently had to have a brand new roof removed and replaced because the previous owner’s contractor did not pull the permit! How to avoid the problem. When you have your home Inspected prior to your purchase you should ask the inspector if there is any evidence of work that might not have been permitted properly. Ask your Realtor or Real Estate Attorney to research records in the Building Department. Also check to see that the work has had its final inspection and that the permits have been closed. The moral of the story: All that glitters is not gold. That beautiful, shiny, newly renovated (yet un-permitted) property might actually be a ticking time bomb! Don’t be the one caught holding that hot potato when it explodes!